BoardGaming.com> Games> Card Games> Spot It! Test your observational skills and hone your reflexes with the award-winning game play of Spot It!, a game of lightning-fast choices for a group of two to eight players. With dozens of awards and possible versions married to elegant gameplay, Spot It! has become a global phenomenon. The game functions on a simple mechanic—fifty-five circular cards, each of which features a number of symbols and has exactly one of those symbols in common with every other card in the deck. With five distinct mini-games, you can be sure that Spot It! will be different every time you play, and because it’s always your turn, there’s never any downtime! No matter which version of Spot It! you’re enjoying, the basic principle remains the same. Each set of Spot It! contains a wide variety of circular cards. Each of these cards has eight different symbols. For example, in the base Spot It! game, one card may have symbols that show a spider, a snowman, a clown, a lightning bolt, a target, an anchor, a stop sign, and a pair of sunglasses. Each of these circular cards has exactly one of its symbols in common with each other card in the game. No matter which mini-game you play in your game of Spot It!, the heart of the game will be trying to find the one common symbol shared between two cards. For each Spot It! mini-game, players don’t pause to take turns—it’s everybody’s turn, all the time. You’ll need to be quick as well as observant if you plan to win. From this simple mechanic, every game of Spot It! offers countless variations with five distinct mini-games to test your observation and pattern-finding abilities. You may choose to play The Tower mini-game, for example. In this mini-game, each player starts with one card facedown in front of them. All the other cards are placed in a stack between the players. The top card of the stack is revealed, and then, at the same time, all of the players reveal their cards. If you're the first player to find the matching symbol between your card and the card on top of the stack, you can call out the name of the symbol and claim the card, placing it on top of your first card and revealing a new card from the stack. When the stack has been depleted, whichever player has the most cards wins the mini-game! Alternatively, you may want to play Triplet. This mini-game begins by placing nine Spot It! cards face up in a three-by-three square. You and your opponents must compete to find sets of three cards that share the same symbol. As soon as you find a set, you call out the matching symbol, and remove those cards from the field, refilling their places with three new cards from the deck. When the deck is depleted, whoever has claimed the most sets wins. Even beyond the different experiences offered by the five different mini-games in Spot It!, you can enjoy dozens of other versions of Spot It! as well. You may learn a few common words of another language with Spot It! Basic French or Spot It! Basic Spanish. You may represent your favorite activity with Spot It! Sports or Spot It! Gone Camping. You can even play with younger children with Spot It! Alphabet or Spot It Jr.! Animals. 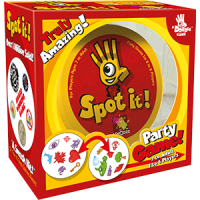 No matter who you are or how you prefer to play, there’s a version of Spot It! for you to enjoy. Put your observation to the test and find the matching symbols! Experience the endless variations and fast-paced, exciting gameplay of Spot It!. Marbles the Brain Store's overview of Spot It! Add a Review for "Spot It!"